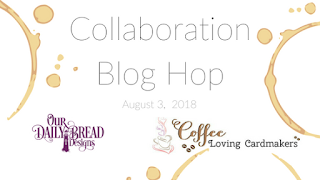 Welcome to the ODBD Blog, we are excited to have you join us for the ODBD/Coffee Loving Cardmakers Collaboration Blog Hop! 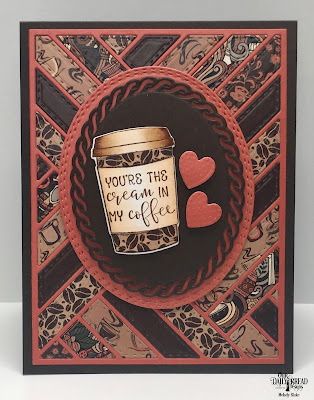 Today some of the ODBD DT members along with the Coffee Loving Cardmakers Design Team are sharing Coffee/Tea related projects using ODBD stamps, dies and pattern paper! Be sure to keep reading to see how you can win a $25 ODBD Gift Certificate and also save 20% on your ODBD purchases on our website from August 3 - 10, 2018! 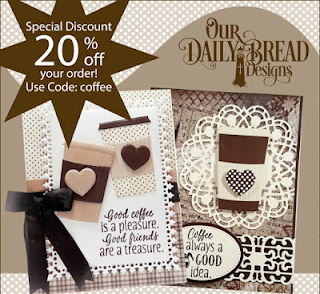 Our Daily Bread Designs carries an extensive line of stamps, custom dies and paper collections, and offers many coffee/tea stamp sets that can be used alone or along with our Beverage Cup die set. Click here to see the ODBD Coffee/Tea stamp sets, click here to see the NCC Coffee stamp sets. The Artistic Outpost Grunge Elements stamp set has a cool coffee ring stamp that can also be used with our Coffee/Tea related stamps and dies! 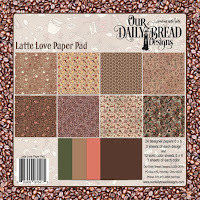 We also have a fabulous paper pad, Latte Love! This 6" x 6" Paper Pad collection features 24 designer papers, 3 sheets of each design and 12 solid color papers, 3 sheets of each color. Click here to see all the papers in this collection! You can click here to shop our website or you can also place your orders by calling our Toll Free Number at 1-877-451-4909. From August 3rd - 10th, 2018, you can save 20% on ODBD, NCC, AO stamp sets, Custom Dies and Paper Collections on the ODBD Website when you enter the code coffee in the discount codes area. Bundles are NOT included in this sale as they are already discounted. Please note, this sale is for our Retail Customers only, and is limited to inventory on hand. The sale is only valid when you enter the code coffee at checkout, and ends on August 10, 2018! Next up on the Hop is ODBD DT Member Angella Crockett, click HERE for more details on her card and to leave a comment on her Blog. 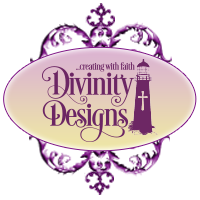 Just for commenting on the ODBD Blog, Angella's Blog or the participating Coffee Loving Cardmakers DT Blogs listed below, you have a chance of winning a $25 ODBD Gift Certificate! For more inspiration using ODBD Products, visit our Samples Gallery, like us on Facebook and follow us on Pinterest and Instagram. Such wonderful projects and inspiration. 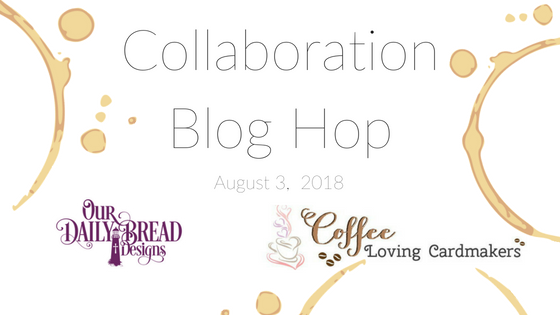 Thank you so very much for collaborating with the Coffee Loving Cardmakers team! Love the cards made! And that purse, oh my! 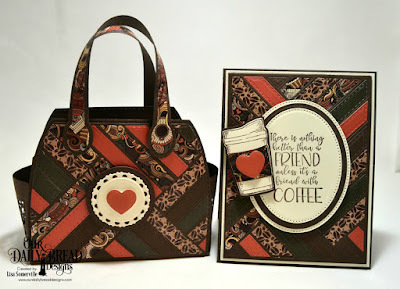 Adorable coffee themed cards and bag! Beautiful Cards! Love the pretty purse too. I think now I need that Ouilted Background Die! Beautiful projects! Love them all... have had so much fun creating with your awesome products now and always! Thanks so much for hopping along with us at CLC and for being a Super Sponsor! Gonna be shopping tonight for sure! Thanks again for everything! I LOVE these fun coffee themed dies and stamps! All of your inspiration looks so fresh and fun! These coffee cards are delightful. I especially like those set in the quilted die pattern. Thanks for sharing these projects and the special discounts! I love the coffee-themed ODBD products and am excited about taking a closer look at the samples. Great inspiration to come, I am sure! Your cards are so fun! You made me smile. What a nice way to perk uo someone's day! Love the coffee theme! Such a bunch of great artists and designers.....Love all of the cards....!!! Awesome job....such cute stamp sets...thank you so much. What a great collaboration! Thank you for all the dies and coffee inspiration! The projects are awesome here, what a fun hop! Fantastic projects! Love the purse! Lovely cards and such a pretty purse!! Wow, so many beautiful projects! Love the dies and all of the beautiful patterned papers! Great paper. Thanks for the inspiration. Love the bag. Awesome! I love a sale. Time to do some serious browsing. Thanks for a fun event and all the inspiration! Thanks for the fun collab hop! Awesome projects! I'm enjoying the hop! Love my set of coffee stamps from Our Daily Bread. Great set. Would love to have another set of greetings. Lovely collaboration hop. The tote is the cutest. Love your company and see you each year at the Scrapbook Expo in Orlando! So fun to get all of this inspiration from a blog hop!!! And with the added delight of it being Coffee inspired!!! Love it!